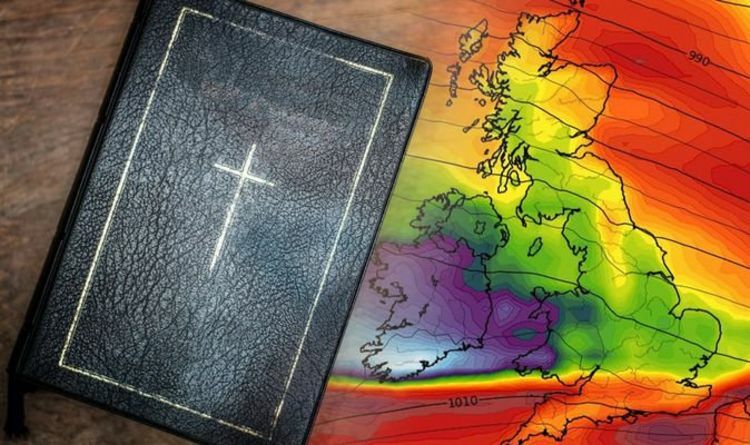 Dr Hugh Sansom, a meteorologist with the Royal Meteorological Society (RMetS) explored the concept of weather in the Bible in 2000, for the journal Weather. The weather expert examined how freak events like violent thunderstorms, dry spells of summer drought and morning dew are represented and described. He wrote: “The New Testament reminds us frequently of the power of prayer and Jesus Himself tells us that if we ask for anything in His name, God will hear and answer our prayers. “What does this mean, if we are praying for a fine day – or indeed praying for rain after a long dry spell? But what does all of this mean for the possibility of weather predictions based on scripture? According to Dr Sansom, there are times when God may directly intervene to change the weather around us thanks to prayer. But the weather expert said prayer is not a “magic formula” of sorts, which promises direct results from the get-go. God can, in some remote cases, “overrule the prevailing weather pattern” in response to devout prayer. Dr Sansom cited an intense showery period in June 1999, when an area of low pressure was passing over the UK. Weather forecasts for June 5 predicted developing showers and thunder for the south of England around midday. But at the annual Fellowship Day of Burrswood in Kent, some 500 faithful Christians seemingly withheld the rain from falling until after the gathering departed in the late afternoon. Dr Sansom said: “In July 1999, also in Kent, there was an open-air wedding between two Christian young people, to which many friends and relations had been invited. “Once again the weather forecast was for widespread showers but, although one could see showers all around, the weather kept fine throughout the service and open-air reception. But the two case studies can hardly be counted as concrete scientific evidence of the ability to affect the weather with the power of prayer. If this were the case, weather forecaster like the Met Office would surely go out of business. There are, however, examples in the Bible of passages, which might actually help people predict the weather. Matthew 16:2 for instance, quotes Jesus Christ as saying: “When it is evening, ye say, it will be fair weather; for the sky is red. A red sky at morning is often associated with developing storms and rain due to water-bearing clouds covering the skies. For the skies to have a reddish hue in the morning, clear skies near the horizon allow sunlight to light up the underside of rain clouds. Dr Sansom said: “It is all too easy, of course, for the sceptic to dismiss all incidents of apparently answered prayer as mere coincidences, and it is as impossible to prove that prayer has any effect as it is to prove the efficacy of weather modification experiments.